It seemed like 2014 was going to be Joey’s last year as he was advised to be given everything he wanted. Diagnosed with Stage 4 Rectal cancer that metastasized to the Liver, Colon and Prostate, he felt aching pain through-out his whole body and was very weak. He can barely walk a few steps without panting. A Chemist by profession, he challenged the medical advice of his doctor and refused to give up. It was by God’s blessing that a family friend recommended that he try the Sante Wellness Centre. Although he was reluctant at first, he followed Doc Ron’s medical advice and after 3 weeks, he started to feel better and see improvements. He continued following the advice for 2 ½ months and with God’s grace he was continuously healed. Grateful to the Almighty for making Sante International a powerful instrument of healing and renewed faith, Joey proudly and passionately shares the life-changing benefits he experienced to as many people as he can by recommending Sante Barley and the Sante Wellness Centre. Start your morning with a cup of Sante Boost Coffee. 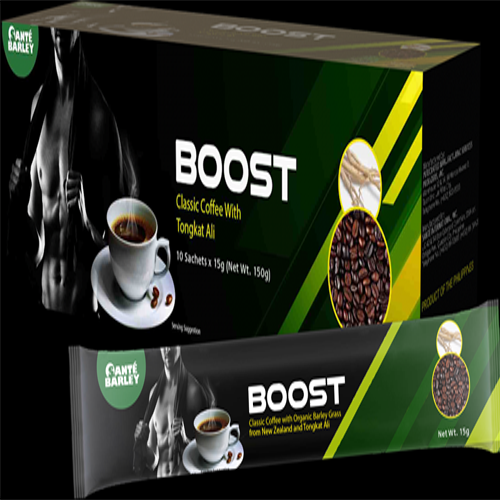 With a strong aroma and rich taste, Sante Boost Coffee is a 15-gram concoction of Robusta coffee beans, tongkat ali from Malaysia and organic Barley grass powder from New Zealand, which helps in vitality and overall well-being. Brewed for active individuals, Sante Boost Coffee will provide you with the stamina and energy you need any time of the day.